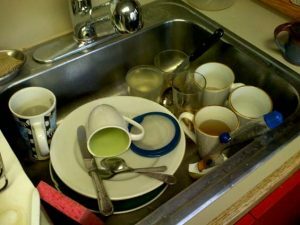 Have you ever encountered a filthy microwave, dirty dishes in the sink, leftovers that have become science experiments, or an empty spot in the frig where your food used to be? Break rooms are one of those common areas, along with bathrooms, cafeterias, and hallways, where we co-mingle with each other at work. Here are some reminders that will help us all play nicely together. There’s no excuse for helping yourself to other people’s food in the frig. There’s a name for that – stealing! Labeled food containers will help, but not solve, the problem of vanishing food. Short of installing closed circuit cameras, you may never know who the food vultures are in your office. But resist the temptation to help yourself to someone’s chocolate cake just because your lasagna went AWOL. Wash your own dishes as soon as you’re done with them. Your department may have weekly clean-up crew assignments, but they wouldn’t be needed if you cleaned up after yourself! Swipe the inside of the microwave while you’re at it and wipe off the counter, too. Before you leave on Friday, glance inside the frig and throw out your uneaten leftovers.